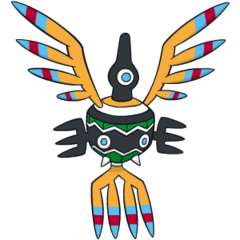 Sigilyph does not evolve/is not evolved into. X The guardians of an ancient city, they use their psychic power to attack enemies that invade their territory. X Einst war es der Wächter einer Stadt aus uralten Zeiten. Wer sich in sein Revier wagt, lernt seine Psycho-Kräfte kennen. X Il était le dieu protecteur d’une ville antique. Il repoussait les envahisseurs à coups de pouvoir psychique. X Fue la deidad protectora de una ciudad milenaria. Ataca con su poder psíquico a los enemigos que invaden su territorio. X Era lo spirito custode di un’antica città. Attaccava con poteri psichici i nemici che invadevano il suo territorio. X 고대 도시의 수호신이었다. 자기 영역을 침범한 상대를 사이코 파워로 공격한다. Y The guardians of an ancient city, they always fly the same route while keeping watch for invaders. Y Vor langer Zeit war es der Wächter einer Stadt. Es fliegt auf der Suche nach Eindringlingen immer dieselbe Route ab. Y Dieu protecteur d’une ville antique, il suivait toujours le même itinéraire afin de prévenir tout risque d’invasion. Y Deidad protectora de una antigua ciudad. Siempre merodea por la misma ruta y permanece alerta en busca de intrusos. Y Era lo spirito custode di un’antica città. Percorreva sempre lo stesso percorso per assicurarsi che non ci fossero intrusi. Y 고대 도시의 수호신. 항상 같은 루트를 순회하며 침입자를 감시하고 있었다. 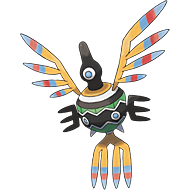 Omega Ruby The guardians of an ancient city, they always fly the same route while keeping watch for invaders. Omega Ruby Vor langer Zeit war es der Wächter einer Stadt. Es fliegt auf der Suche nach Eindringlingen immer dieselbe Route ab. Omega Ruby Dieu protecteur d’une ville antique, il suivait toujours le même itinéraire afin de prévenir tout risque d’invasion. Omega Ruby Deidad protectora de una antigua ciudad. Siempre merodea por la misma ruta y permanece alerta en busca de intrusos. Omega Ruby Era lo spirito custode di un’antica città. Percorreva sempre lo stesso percorso per assicurarsi che non ci fossero intrusi. Omega Ruby 고대 도시의 수호신. 항상 같은 루트를 순회하며 침입자를 감시하고 있었다. Alpha Sapphire The guardians of an ancient city, they use their psychic power to attack enemies that invade their territory. Alpha Sapphire Einst war es der Wächter einer Stadt aus uralten Zeiten. Wer sich in sein Revier wagt, lernt seine Psycho-Kräfte kennen. Alpha Sapphire Il était le dieu protecteur d’une ville antique. Il repoussait les envahisseurs à coups de pouvoir psychique. Alpha Sapphire Fue la deidad protectora de una ciudad milenaria. Ataca con su poder psíquico a los enemigos que invaden su territorio. Alpha Sapphire Era lo spirito custode di un’antica città. Attaccava con poteri psichici i nemici che invadevano il suo territorio. Alpha Sapphire 고대 도시의 수호신이었다. 자기 영역을 침범한 상대를 사이코 파워로 공격한다. White The guardians of an ancient city, they use their psychic power to attack enemies that invade their territory. White 2 The guardians of an ancient city, they always fly the same route while keeping watch for invaders.